Will 2degrees get 4G anytime soon? Forums › 2degrees › Will 2degrees get 4G anytime soon? Does anyone know if 2degrees is planning to launch 4G this year? I'm tempted to move to Vodafone for 4G, but I don't want to leave 2degrees, as they've been great for years. Obviously 2degrees won't want to release any info until there's an official announcement or press release, but has has anyone heard anything about it? All the articles I've Googled are pretty old, and mostly just about purchasing of Spectrum. There was talk that they are looking at rolling it out this year. Sorry, don't have a link, but I think it has been mentioned in a recent press release. Have you looked at the Vodafone 4G coverage map? johnr: Have you looked at the Vodafone 4G coverage map? hmm ok point taken, hadn't done so in a few months by the looks of it!! holy crap, i take it back, youve done extremely well since the last time i looked :). Theres some really random places that have 4G while larger places like where i am don't have 4G (Blenheim) and Invercargill, yet lake brunner has it? As well as Kaikora and Motueka.. Its obviously constantly evolving and im sure in the next couple of months it will show up here. coffeebaron: There was talk that they are looking at rolling it out this year. Sorry, don't have a link, but I think it has been mentioned in a recent press release. From what I understand there is still some arguing going on over the spectrum. Remember that 2D is still building their 3G network so 4G might take a little longer than hoped. The plus side is that because they are still building their 3G network and because 3G and 4G are different standards they are able to install cell towers in locations that future proof for 4G rather than having to retrofit existing towers. Theres some really random places that have 4G while larger places like where i am don't have 4G (Blenheim) and Invercargill, yet lake brunner has it? BTR: From what I understand there is still some arguing going on over the spectrum. Remember that 2D is still building their 3G network so 4G might take a little longer than hoped. Not sure what spectrum issues you speak of. They have 1800 MHz avaiable (3GPP band 3) which the other 2 carriers have built out across the country. 2Degrees just need to get the back end going, wire up the new panels and do a mulitude of other things, but spectrum is not the blockage. "Mr Sherrif (2degrees CEO) said the company's existing 1800MHz and 2100MHz spectrum was sufficient for 4G launch in early 2014." We will be rolling out 4G this year but cannot give an ETA at this stage. There were arguments between the Telcos on how much spectrum was available for purchase. One of the big telcos i.e. Voda or Telecom was trying to purchase 60% of what was available and this was causing the two remaining telcos to argue against it. It may have been solved but thats what I was told late last year. 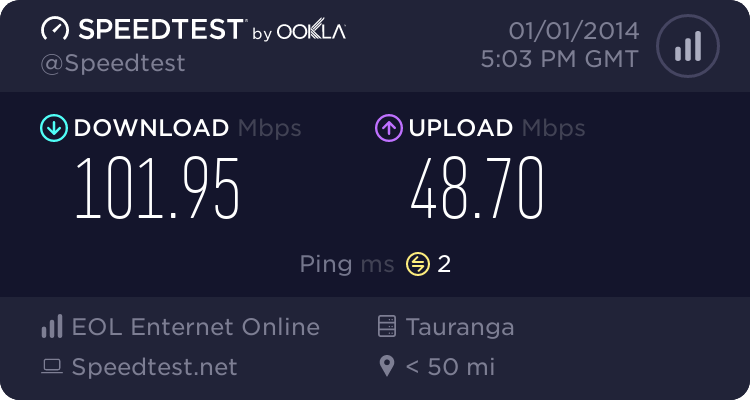 Ok, from unofficial source (senior network engineer) who happen to be my close friend, the 4G network will be ready for auckland, wellington and queenstown by 31st march. The switch will be flicked on exactly midnight on 1st April.